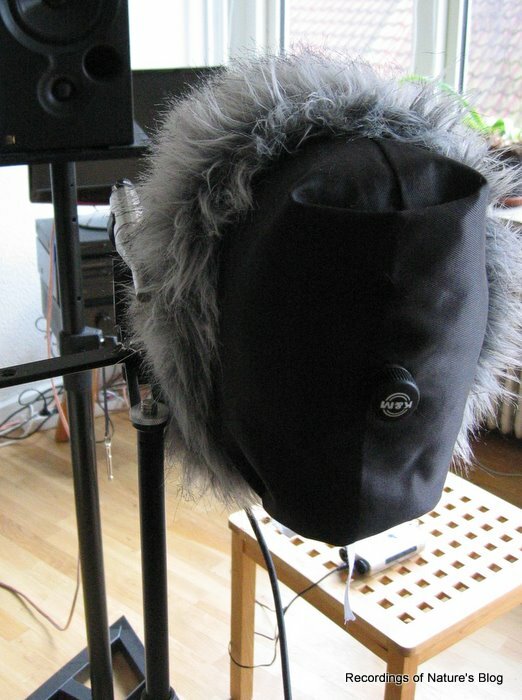 Getting closer to the final aim of my investigations, this post will present some investigations on combining the microphone horn addons with a dummy head to form a quasi binaural recording setup. So my approach is to use a combination of a horn addon and a dummy head. The dummy head will provide the natural time delay between the ears and also a great deal of left-right volume separation. The horn addons will do additional focusing and add a little of directional coloration. The horns will also emphasize a given frequency band according to the recording situation. 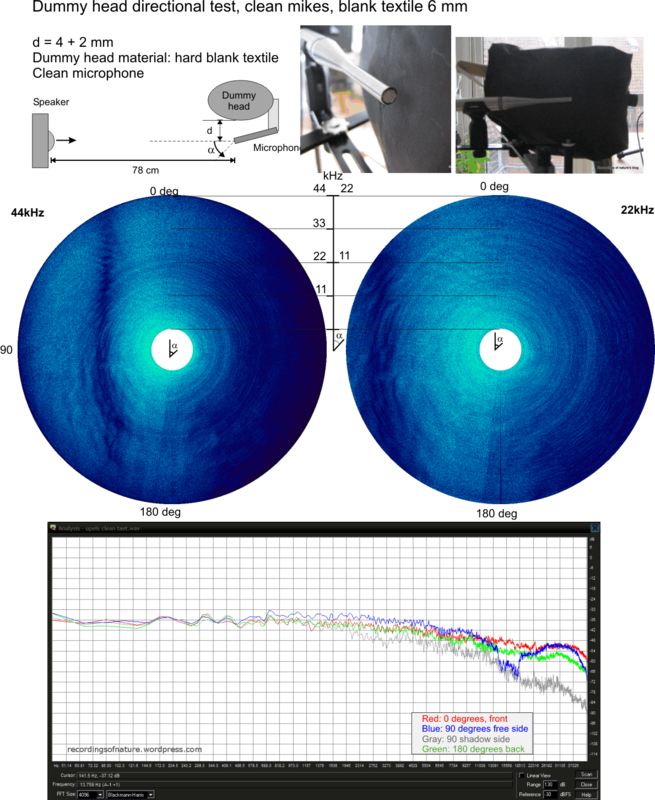 Using the directional testing method from the earlier post Horn directionality it is possible to get at good overview of the frequency response and directionality. The dummy is constructed using a yarn bobbin of the same size of a human head, covered with a textile top layer. Different types of top layers can be applied to get a desired acoustic effect. On the pictures above an additional collar of fibers is added to further reduce reflections. The microphone is placed outside the center o the head when seen from the side. The images above show a typical test setup which can rotate keeping the microphone tip at the rotation axis. 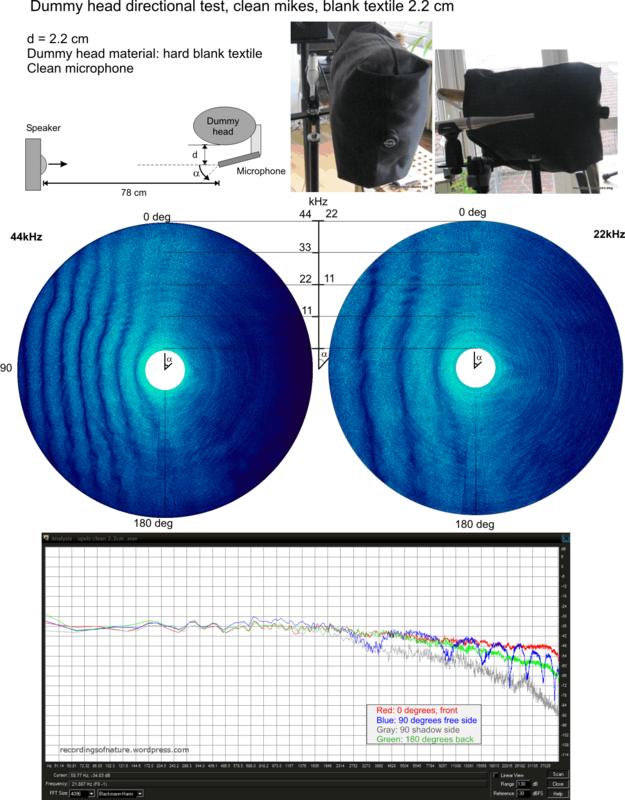 Noise was sent out by a speaker 78 cm away, and the setup was rotated 360 degrees in 60seconds. Again, the post processing was done using CoolEdit Pro to generate a spectral view, which following was converted into polar coordinates in GIMP. The charts below show the results for different dummy setups. 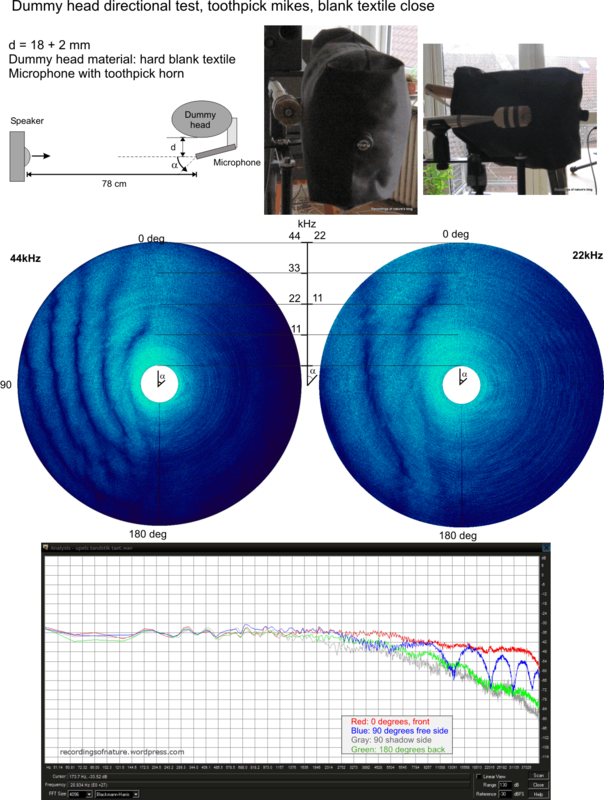 The varying parameters are the distance between the microphone and head, different horn addons, and different materials on the dummy head. Here the dummy head has blank textile top layer. Clean microphone placed at the side with a distance of 2.2 cm to the side walls. This setup clearly suffers from strong reflections from the side walls giving a dominating comb filter effect for sounds coming from the free side. The minima corresponds well to d=(2n-1)*lambda/4, ie lambda=4d/(2n-1)=4d/1, 4d/3, 4d/5 … etc. This setup has very a small difference between front and back. Same setup as above but with a distance of 2 mm to the side wall. Again strong reflections occur from the side wall, but the first minimum of the comb filter is now around 14 – 19 kHz, thus much less of a problem. This setup resembles a boundary type setup. 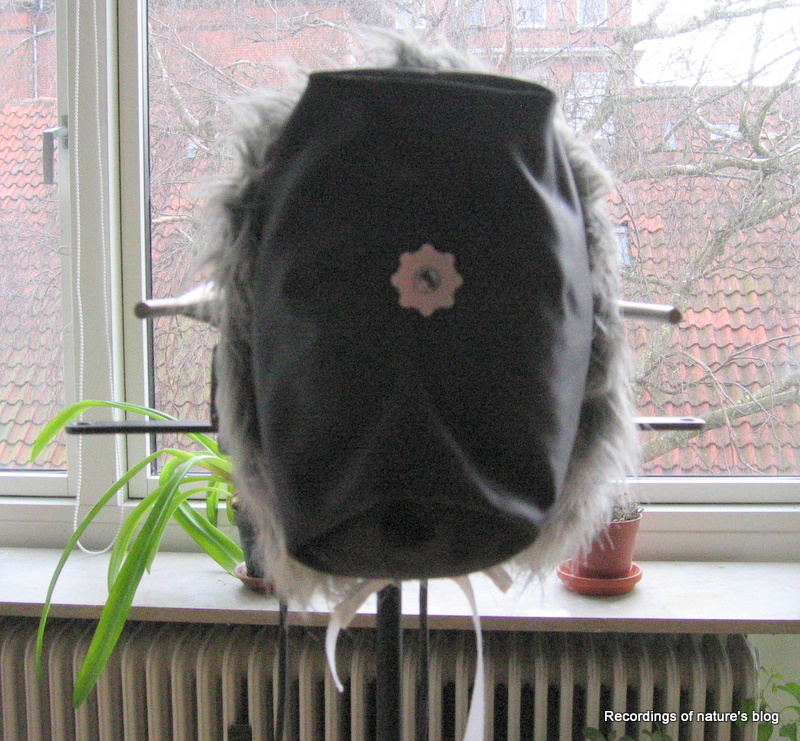 Dummy head with woolen top layer and fur sides. Clean microphone placed at a distance of 3 cm. This top layer has a good acoustic absorption and effectively eliminates reflections compared to the blank textile. Tiny ripples can however still be seen for sound coming 90 degrees from the free side. The spectral image is very homogeneous in all free directions, especially for frequencies up to 22 kHz. Same as above but with a minimum distance, almost touching the side wall. Putting the microphone closer to the side walls with this setup only slightly changes the result. The shadow side is clearly increased. 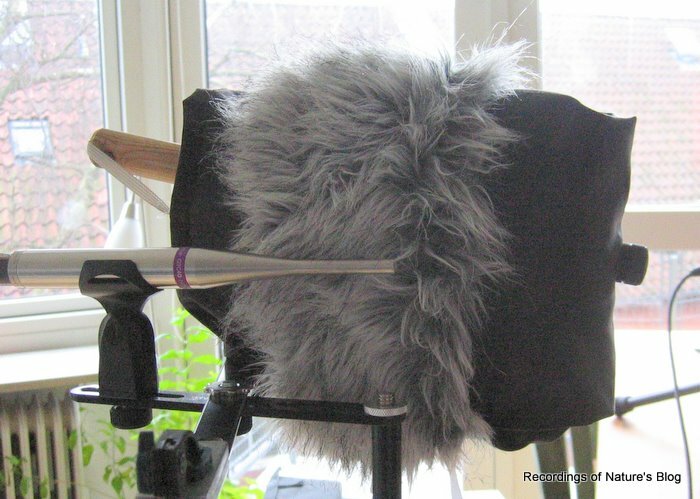 Here the dummy head only has the blank textile top layer and the microphone is fitted with a toothpick horn which is almost touching the sidewall. The toothpick horn shape is flat sloping outwards, pointy side. Effectively the microphone tip is about 19 mm from the side wall. The reflection pattern from the side wall dominates the frequency response with a comb filter effect. Due to the horn an asymmetric pattern is seen, with a larger difference between front and back. Dummy head with woolen and fur sides. Again microphone with toothpick horn, almost touching the sidewall. 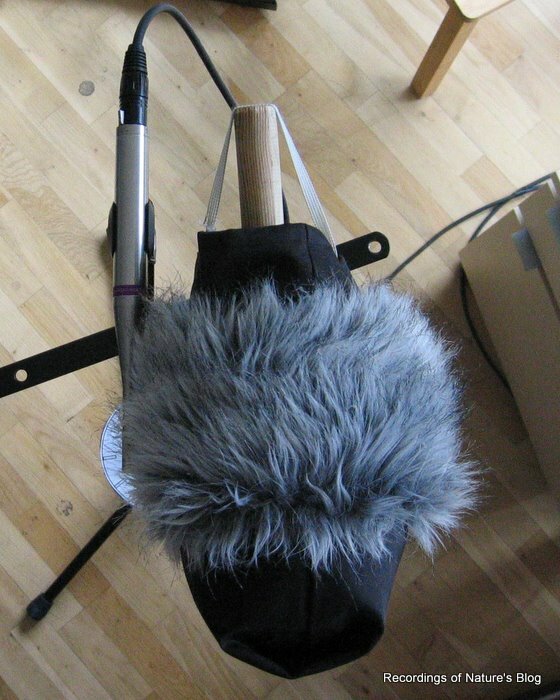 This setup has a good reception for sounds coming from the front (0 – 45 degrees). At 90 degrees angle a minimum is found at 17 kHz. At even higher angles frequencies above 2 kHz are attenuated gradually. A bit of presence boost is found for sounds coming from the front. This setup has good reception from font angles and gives a fine coloration as the sound is turned around. I believe this should give a good directional sensation. The surface material of the dummy head is very important and can potentially have a high influence on the received directional response. If the material opposite the microphones is reflecting the sound waves, negative and positive interference occurs (comb filter). When the sound comes right from the side, the first negative interference occurs when the distance is equal to 1/4 of the wave length, the following at 3/4, 5/4, 7/4 etc. To avoid this, a sound absorbing material must be used. I think the the final setup no. 6 shows the most promising behavior for nature recordings due to the good front side presence and the gradual coloration when rotating towards the back. Setup no. 2 has a more front-back symmetric pattern with a high midtone boost for sound coming at 90 degrees. Setup no. 3-4 with clean microphones may be useful if a more flat and omni directional frequency response is needed.